Scoutreach is supported by a group of compensated individuals that demonstrate a sincere appreciation for Scouting and the lives impacted. Donald (Don) began working with Scoutreach in 2003, when his church chartered a pack and troop. After retiring from GM Powertrain in 2009, Donald was approached by the District Progressional to become a Program Specialists and officially joined in 2012. He has grown by the experience as well as seeing the youth identified with being a "Boy Scout." "I'm proud that Scoutreach scouts have participated in summer camp, Dr King unity celebration, and trasfer into volunteer-led troops to earn advancements." Aaron is currently the second-most senior team member. He's an Electrical Engineering Technology major currently attending the University of Toledo. 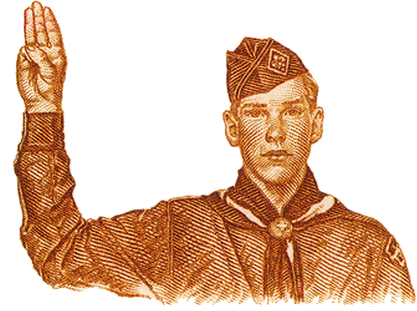 He earned his rank of Eagle after participanting in the Cub Scout to Scouts BSA ranks. "Boy Scouts has always been an important part of my life, and I'm glad to get the opportunity to give back to young Scouts, so they can have the same experience I had growing up." Daion is a Detroit native and currently enrolled at Lourdes University as a freshman. Daion serves Scoutreach District as a parent engagement and Scout engagement focused Work Study Student from Lourdes University. "I enjoy working for Scoutreach for many reasons, but above all it teaches young boys resourceful things that they can use all throughout their life." Risa currently attends the University of Toledo, majoring in Recreational Therapy. She serves Scoutreach as a Program Specialists and active in several campus organizations, including Sigma Gamma Rho Sorority, Inc. "I wanted to be apart of Scoutreach because I have a desire to impact the lives of today's children." Osmar is a graduating senior from Lourdes University serving Scoutreach as a Spring Intern (focusing on Business) and Program Specialists. He is from Nicaragua and speaks two languages (Spanish and English). "I like working with this agency because it is an important symbol for the new future in this country." Keyvona currently attends Lourdes University and working towards a bachelor's degree, but originally from Columbus. In addition to serving Scoutreach as an Intern (focus on Marketing) and Program Specialists, she is a Lourdes University basketball player. "I desired to work for Boy Scouts for many reasons, mainly due to their values. I'm a family oriented person and I feel as though the Boy Scouts offer that and so much more." Michelle joined Scoutreach in 2019 as the Program Lead. Michelle brings both professional experience in marketing and event planning, and personal interest in kids and outdoor activities. "My Eagle Scout son had a great experience participating in the Boy Scouts of America for many years. Now that he's in college, serving with Scoutreach gives me the opportunity to revisit these fun learning projects with the next generation of Scouts."